Samsung is bringing live traffic data and other new driving-related functionality to users of some of its Galaxy devices following a deal with traffic info provider Inrix. Due to arrive “just in time for the holidays,” the deal will see Inrix’s data power “several new apps and services” aimed at saving drivers time and frustration. In addition to providing live traffic info, the deal also means apps can more accurately represent the time of arrival. 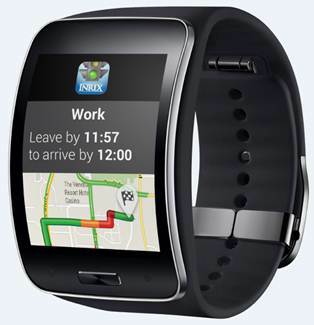 Initially, the new features will only be available on the Galaxy Note 4, Galaxy Note Edge and Gear S smartwatch. Among the new apps is a ‘Car Mode’, which automatically sets the device into a more driver-friendly, larger UI and provides route updates. As well as monitoring traffic, it’ll also alert you to accidents on your route, the closest available private parking and the least expensive place to top-up your fuel tank. There’s also an accompanying ‘My Places’ widget for your homescreen for at-a-glance travel info. For Gear S smartwatch users, the Inrix XD traffic integration allows you to receive departure alerts for your favorite places and estimated duration of travel. Rounding off the list of app tweaks, the Morning! Smart Alarm Clock can also now make use of the Inrix integration, allowing you to get weather, traffic, appointment and email notifications before you even get out of bed.